Midwestern Gothic – A Literary Journal » Blog Archive » Issue 18 is here! 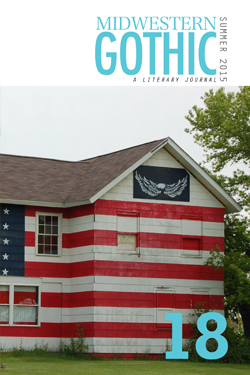 Midwestern Gothic Issue 18 (Summer 2015) is here! Grab some shade and an afternoon to spend with new fiction and poetry from the Midwest’s finest literary voices. Issue 18 features work from Dave Barrett, Monica Berlin, Meredith Boe, Justin Carmickle, Grady Chambers, Marianne Chan, Jenelle Clausen, DeLeon DeMicoli, Chris Drabick, Jessica Duncan, William Engelhart, Wil Gibson, Jason Marc Harris, Stephanie Heit, Steve Henn, Joseph Horton, Coop Lee, Greg Loselle, Katie Kalisz, Alex Mattingly, Courtney Elizabeth Mauk, Christopher Merkner, Lia Swope Mitchell, Alex Mouw, Brian Pals, Casey Patrick, Catherine Rankovic, Dale Patterson, Robyn Ryle, Shane Stricker, Matt Weinkam, Alexander Weinstein, and Brenna Womer.